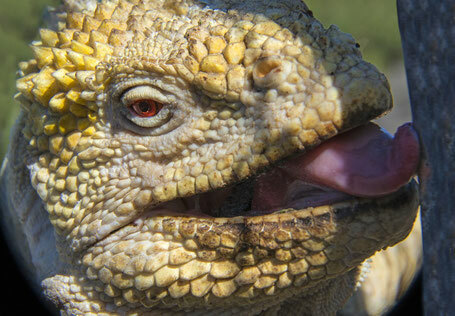 Guests fly to the Galapagos Islands from mainland Ecuador, arriving normally in the late morning. The GWSP dive masters and yacht dive master/naturalist guide will be waiting at the airport on San Cristobal Island. Once the group has collected their luggage and cleared the National Park immigrations we will board the Yacht which will be anchored in the port 10 minutes travel by bus. After everyone has settled in their cabins the guides will give a briefing on ship life, national park rules and diving safety, whilst the galley crew prepare the dining room for a delicious buffet lunch. After the briefings, the boat will depart for a short crossing to Isla Lobos for your check out dive and safety briefing. This will be in calm shallow waters and a maximum depth of 12m. Although plentiful fish and usually sea lions and other species are to be seen, the objective is to check weight and equipment for the following days. After dinner the vessel will depart to the next scheduled destination. Dropping off the steep rocky cliffs onto sand and boulder slope we drift gently with the current. 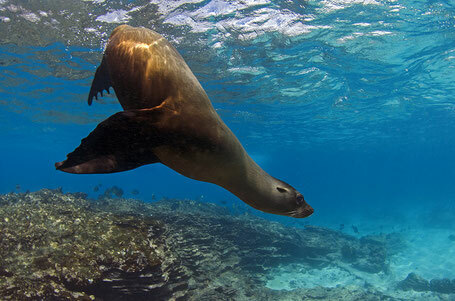 Sea lions, turtles, rays and sharks, mostly white tip reef sharks and occasional Galapagos sharks are common. Schools of Angel fish, grunts and snappers abound. Eels are found amongst the rocky areas. A perfect dive to ensure you are correctly weighted and ready for the days to come. Afternoon visit which will be a highlight of your trip. 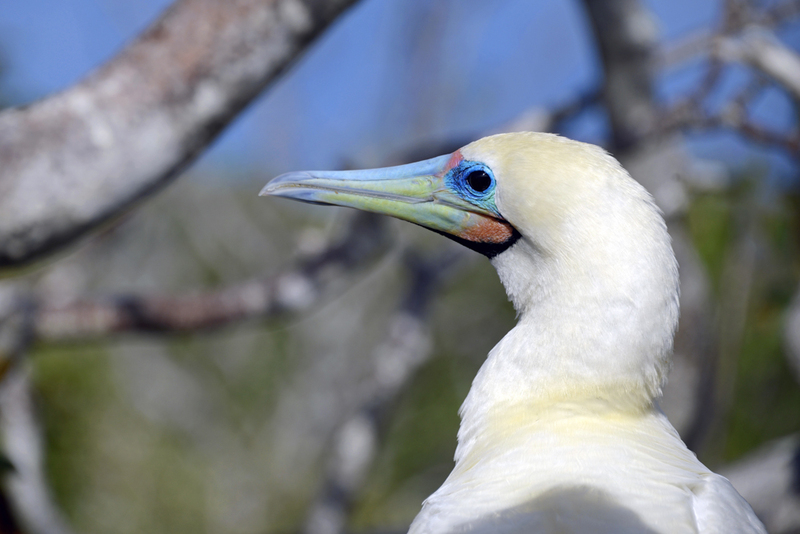 North Seymour is a cosmos of the Galapagos. Walking the path around North Seymour Island we will see native and endemic species of reptiles and marine birds. 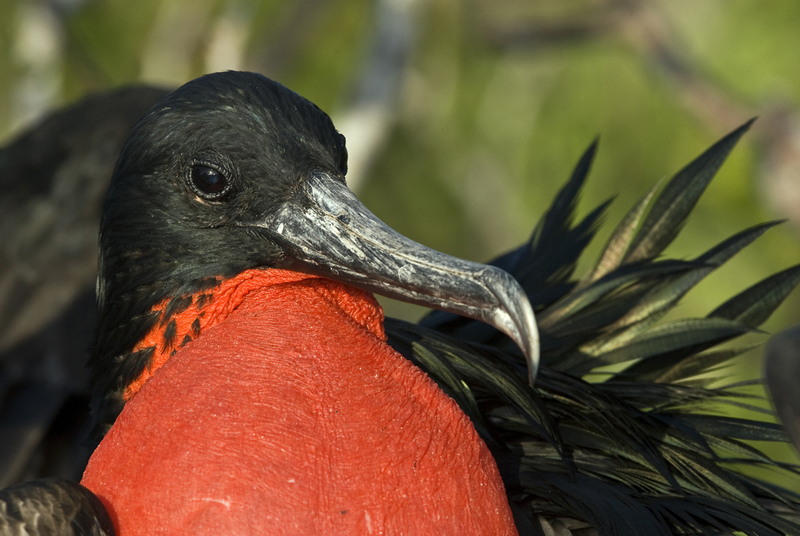 One of the few places to observe the spectacular Great and Magnificent frigatebirds with their inflated "gula" pouches in all seasons. 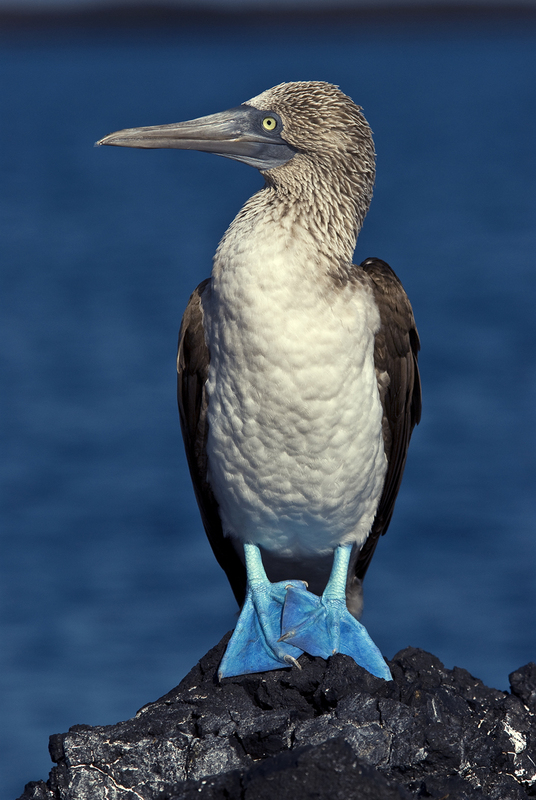 The famous Blue footed boobies with truly blue feet often courting at this time of the year and even with chicks. Galapagos land iguanas, marine iguanas, sea lions with newborn pups along the beach and coastal path that you might have to step around! This island has it all! After this visit we set sail for the next day's destination Wolf Island. 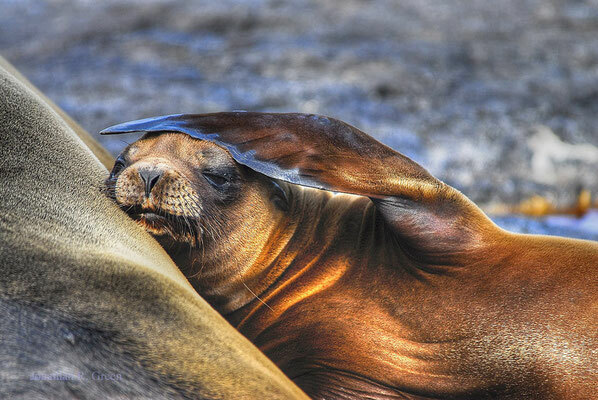 The sailing time is around 14-16 hours as we sail through the late afternoon and all night past the majestic volcanoes of Isabela Island to the far north of the Galapagos archipelago. The powerful marine currents around Wolf are part of the reason we see so many sharks. 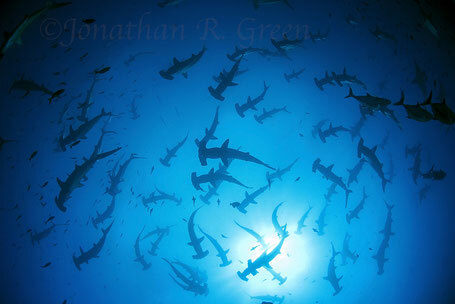 Schooling hammerheads, Galapagos sharks, Black tip and Silky sharks are the usual protagonists. Dolphins are often present as we end our dives with a drift in the blue. 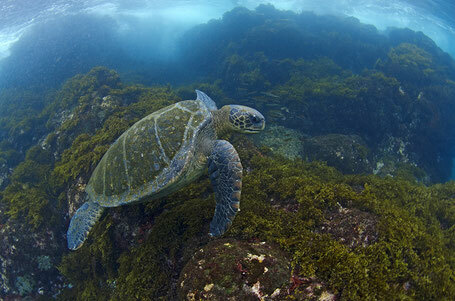 Two turtle species, the Green and Hawksbill are frequently sighted along the rocky walls and slopes of this island. Eagle rays and large schools of fish, snappers, grouper and jacks patrol the drop-off. We stay for another 2 dives in this magical place of Wolf Island. The island is also home to vast numbers of sea birds, Red footed and Nazca Boobies, frigate birds, the endemic Swallow – tailed gull and the elegant Red – billed tropicbird. Finches and doves are often spotted hoping amongst the rocks. All two dives are at the same site, the world renowned Darwin Arch. We drop on to a rocky ledge and from a protected position watch the marine life swim by. 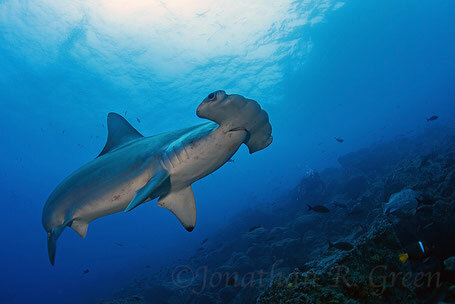 Hammerhead and Galapagos sharks, Black tips and Silkies. Marine turtles abound and Bottlenose dolphins often pass by overhead. Huge schools of fish, tuna, jacks and Creole fish swim in the blue whilst dozens of other species inhabit the coral covered platform and ledges. 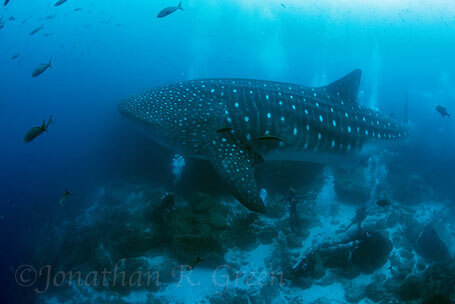 This is also the realm of the biggest shark of them all, the Whale shark. Frequenting the Islands between June – December over 95% of all sightings occur here at the Arch. Of these a staggering 99% are female and in an apparent state of advanced pregnancy. 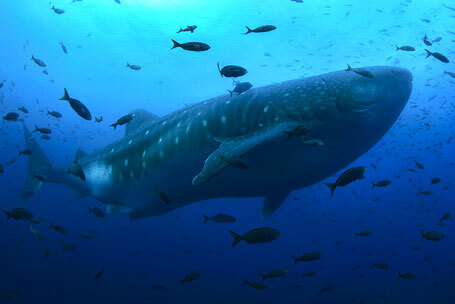 Why they come to this rocky volcanic outcrop remains a mystery and one that the Galapagos Whale Shark Project team is trying to solve. After our last dive the vessel returns to Wolf to anchor overnight. Another full day exploring the diverse dive sites of Wolf. The dives may take us to the swim through arches and along the spectacular walls and cave entrances. Again the local conditions will decide which are the best options dependent on current and swell. More time to observe the sharks and marine megafauna or study the massive diversity of life that inhabits the large coral heads and boulder slopes. Towards evening we set sail for Cousin's Rock, once again sailing overnight. 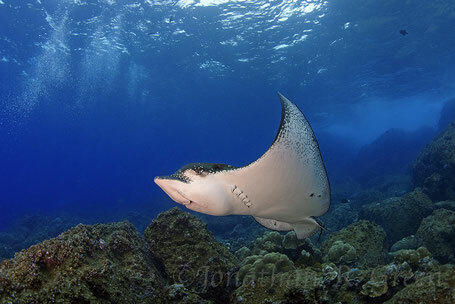 Here we often find playful sea lions, Eagle rays, Golden rays and sometimes Mobula and Giant Pacific manta rays. The underwater topography provides refuge for sleeping turtles and white tip sharks whilst the stepp walls are covered by marine invertebrates. Two species of black coral, sponges and colonial tunicates are a colourful backdrop for the abundant fish that frequent this emergent volcanic cone. 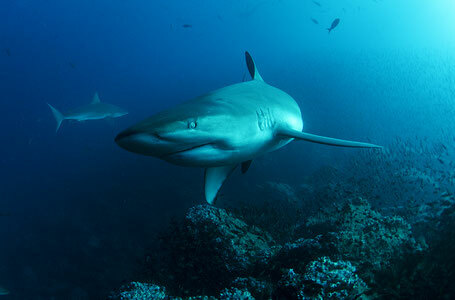 The currents often found here attract some of the larger shark species such as hammerheads and black tip sharks. Amongst the corals we sometimes find Pacific golden sea horses and frogfish. 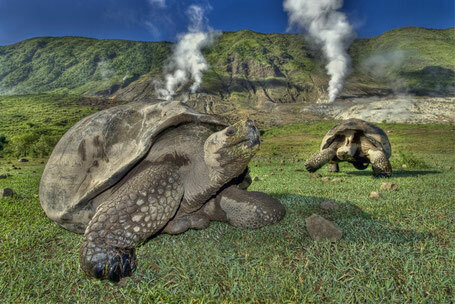 In the afternoon we visit the highlands of Santa Cruz to observe the giant tortoises in their natural habitat. The afternoon gives us the oportunity to visit the town of Puerto Ayora and the Darwin Centre. Dinner on your own or as most groups prefer and dinner together in Puerto Ayora. Return to the ship at 8:30pm. Depart the vessel by 9 am. Guests are free to visit the beach in town to see sea lions and marine iguanas in their natural habitat or take a short walk to the Interpretation Centre.